Free Breakfast at Mimi’s Cafe! Have you had breakfast at Mimi’s Cafe before? If you haven’t you are missing out! The fresh squeezed orange juice and the fresh baked bread and muffins are just the beginning to the great breakfast. Mimi’s Cafe has a balanced menu of yummy sweet and delicious savory breakfast. I want to try the Blueberry Stacked Cinnamon Brioche French Toast (pictured below). I signed up for Mimi Cafe’s eClub right before my birthday. Since then, I have received 3 offers for free dinner or breakfast in the past 4 weeks. They are pretty generous! 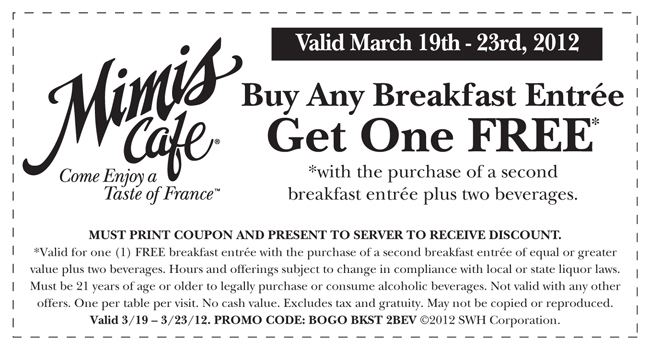 Enjoy your buy one get one free breakfast coupon at Mimi’s Cafe!